On one level, Armstrong is right that he did raise a lot of money for cancer research through Livestrong. That may have figured into some of the anger at him, though, as along with his regular denials that he was using performance-enhancing drugs (and his efforts to ruin the lives of those who accused him of PED use), he always emphasized his Livestrong work as something that showed how good he was. Rodriguez has plenty of faults of his own, and has taken plenty of criticism of his own, but he didn’t go after accusers to the same extent, and never really tried to portray himself as a hero. And his post-PED approach has included a lot of admissions and a lot of apologies, a pretty noted contrast to Armstrong’s attempt to hold that off forever and subsequent complaints about everyone else. And Armstrong’s also wrong to suggest that everything’s great for Rodriguez. There are still tons of people who hate A-Rod, some for his less-than-stellar work as a TV baseball analyst but many just because of his history with PEDs. Some questionable moves by the Yankees in handling his 2013 injuries got a fair bit of support given his past and the distaste for him. It should also be noted that admitted PED users have largely been kept out of the Baseball Hall of Fame so far, and that may happen to Rodriguez too (he won’t go on the ballot until December 2021). And yes, A-Rod now has two baseball analyst gigs, a sports business podcast and a forthcoming sports business show, but that doesn’t mean he doesn’t take criticism; it’s more a reflection that A-Rod’s acting in a way that makes him more marketable than Armstrong (and also, there isn’t a Sunday Night Cycling show for Armstrong to land on). Look, complaining about double standards for PED users has some validity, and that’s perhaps particularly true in baseball, where various amphetamines and other against-the-rules substances used over the years never created the backlash we’ve seen around steroids. And sure, Armstrong’s past rule-breaking shouldn’t mean that he’s forever excluded from public life. But the way he’s handled this whole thing doesn’t exactly make people favorably disposed to him, and it should be noted that he’s had some opportunities too (particularly a guest appearance in HBO’s Tour de Pharmacy spoof), and that they’ve generally led to a lot more criticism. 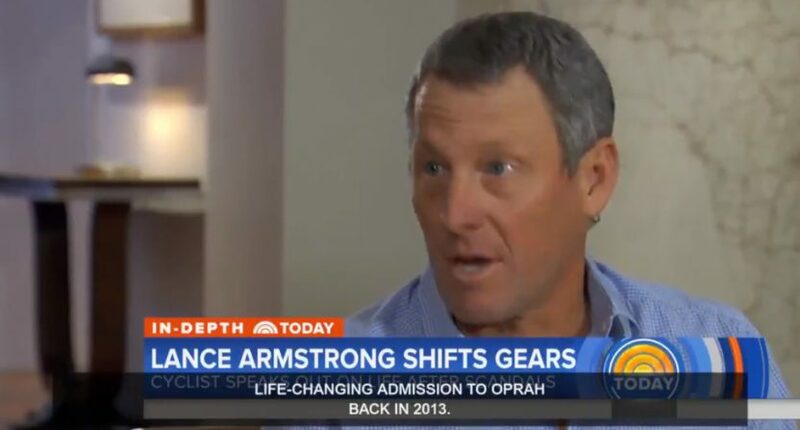 Armstrong’s attempts to sell himself as the last clean cyclist and an outright hero, and his attempts to destroy anyone who tried to implicate him, went way further than anything A-Rod did, and so it shouldn’t be surprising that many people are still more upset at Armstrong. A-Rod isn’t exactly a beloved public figure, but he’s a somewhat-accepted one. Maybe Armstrong can reach that level someday, but complaining like this doesn’t exactly help his cause. (And besides, Armstrong should be fine; he invested $100,000 in Uber early on, a stake that could now be worth an estimated $3.2 billion, so he doesn’t really need TV income.) And making whiny TV appearances blasting everyone else while not owning up to his own mistakes doesn’t exactly seem like a great path back to the public eye for Armstrong.